Chillicothe hosts one of the finest hovercraft events in the country each summer on the Scioto River. The event usually lasts 3-4 days around the last weekend in June. There are a number of hovercraft events throughout the country, but if you're into the sport, Chillicothe is the place to be for the largest hovercraft event in North America. There are a number of different classes of hovercraft that include amateur all the way up to the Formula 1 National Championship class. The event includes racing of all types including a 40 lap endurance race and point-to-point challenges. The event usually includes a long distance cruise-in where hovercraft lovers from around the state and beyond come to enjoy the scenic beauty of the Scioto River. Each year the event seems to get bigger and bigger. Driving a hovercraft is like driving a car with 4 flat tires on ice, except more fun. 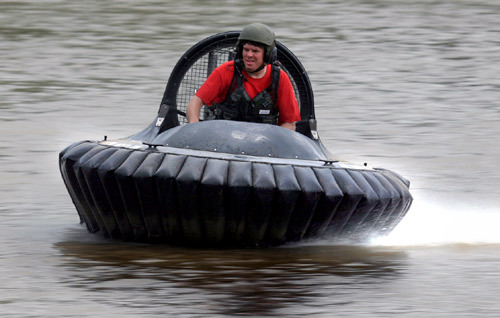 Hovercraft are designed to float on air over water or land or both and they're propelled by a large fan on the rear. Types of hovercraft run the gamut from homemade models and designs to elaborate professional designed models.